Drippy slime with only 3 ingredients! 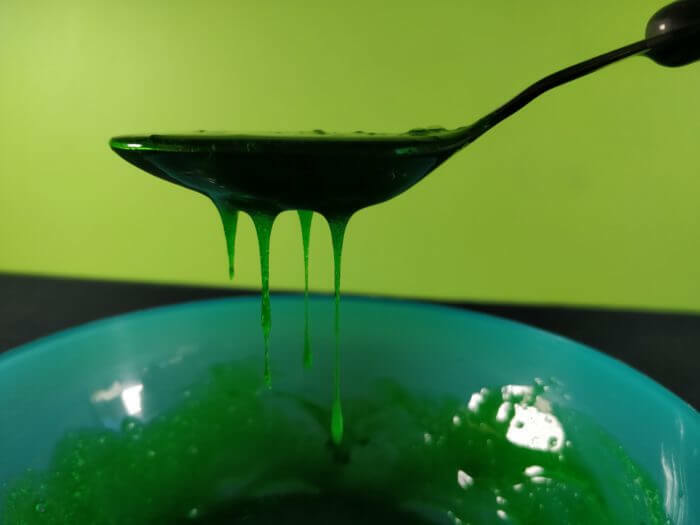 This is one of the most popular, inexpensive slimes to make! Check out our recipe and what we got up to with the oobleck we made! This slime is a shear-thickening non-Newtonian fluid: feels like a liquid when small amounts of force is applied, but acts like a solid when a lot of force is applied. But it’s not just great as a plaything, plenty of research is being done about how to use this special material in modern technology. What is it good for then, you say? Local and international scientists, as well as engineers, have been developing liquid body armour using non-Newtonian fluids, since they are really good at stopping bullets! Why not assign your students the task of designing a product that utilises the unique properties of non-Newtonian fluids as a science project? Get creative by mixing food colouring and glitter into your slime! Squeeze some detergent into the container. Add colour or glitter for a sparkly effect! Sprinkle over a pinch of salt, then mix well with a spoon. Repeat step 3 until a slime consistency is reached. Each addition could take a minute or so to mix in so be patient. If too much salt is added and the mixture becomes runny again, add a bit more detergent. Note: If anyone develops skin irritations to soaps and detergents, rinse with plenty of water. When choosing a detergent, make sure it contains anionic surfactants. A surfactant is usually a molecule with a hydrophilic “head” and a hydrophobic “tail”. This means that it is able to bridge between water-soluble and oil-soluble interfaces. An anionic surfactant is one with an anionic functional group at the “head” position. They are the most common surfactants used in industry, typical examples are lauryl sulfates, laureth sulfates, sulfonates and phosphate esters. If your soapy liquid of choice has one of these chemicals in its long list of ingredients, it should make a slime when you add just the right amount of salt to it. The tricky part of making this slime is determining exactly how much salt to add. Some detergents have varying amounts of anionic surfactants. Others (like the hand soap we tested) is already thick and gloopy, which is why it only took one little sprinkle of salt for one cup of liquid to produce a slime. The texture was also not greatly different from before. As soon as too much salt was added (I gave it a heaped spoonful), the mixture became runny and thinner than at the start! In contrast, the dishwashing liquid (15-30% anionic surfactant as stated on the label) required a higher detergent to salt ratio before a slime was formed, and the change was much more impressive! So why does this happen? When surfactants are in solution they can sometimes arrange themselves into these aggregate units called micelles, where all the surfactant molecules have their “tails” pointing inwards and “heads” pointing outwards, or vice versa. In the detergents that we used to make the slime, the micelles formed have anionic “head” groups sticking out into the solution, with their hydrophobic “tails” in the centre. This gives the micelles a certain charge density on its outer surface, which can be affected by the addition of salt. The ions from the dissolved salt, at the right concentration, can cause bigger micelles to form and pack closer together, resulting in a thicker mixture or gelling effect. But if salt concentrations are pushed beyond that optimal level, the micelle structures can break down and the mixture viscosity will decrease. 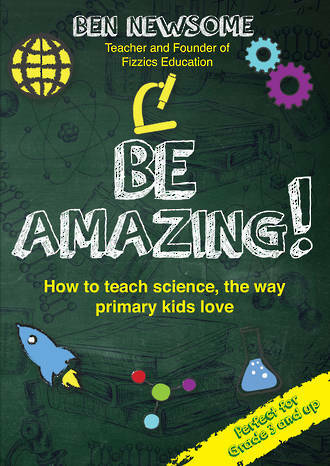 Wouldn’t it be a fun experiment for your students to make bucket-loads of slime and find the salt curve of a given detergent? A great way to segue into variable testing! So messy, but at least everyone is already clean! 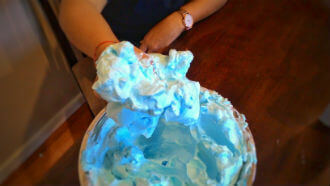 Add the soap flakes and mix with an electric beater on high until a thick foam is produced, about 5 to 10 minutes. Watch out, this foam seems to expand exponentially! Play with your soapy slime right away, or let it sit for a few hours. The texture will change! Whipping the hot soapy solution creates a foam, which is a colloidal dispersion of a gas in a liquid. The gas, in this case, is air and the liquid is the soapy solution. This slimy foam has a totally different texture compared to the other slimes, allegedly the “best feeling” one out of all the ones we have tested. A small amount can easily fill a large tub, which makes it an inexpensive way to make mountains of it for the kids to play! 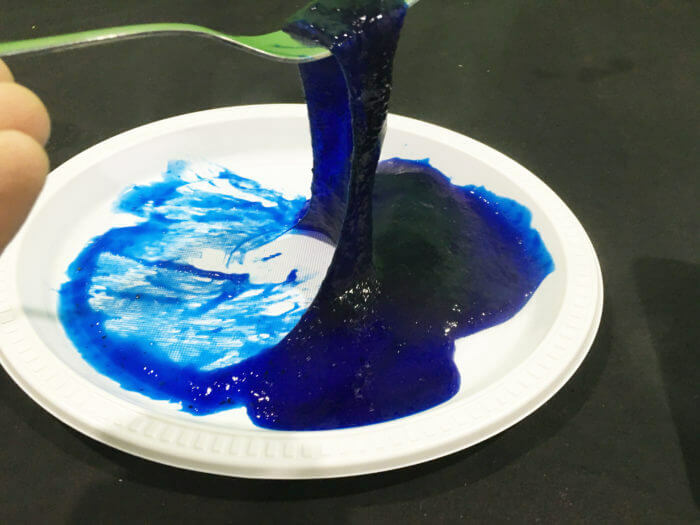 Flubbery edible slime that overflows like lava when you make it! Don’t like the idea of using all these cleaning agents and glue with toddlers who seem to put everything in sight through a taste test? Try this edible slime! Add the psyllium husk powder and whisk until combined. Microwave on high for 5-9 minutes, the longer the heating process, the more rubbery the flubber gets. After the initial 2 minutes, the goo tends to rise and overflow, stop the microwave each time it starts to do that and restart after a few seconds. Remove bowl (caution: very hot!) and tip content onto a plate and let cool. Psyllium is a type of seed, and its outer shell or husk is often used as a dietary fibre supplement (Metamucil, for example), or as a food thickener. The psyllium husk contains mucilage, or a gel-forming polysaccharide. This stuff is hydrophilic, which means it loves binding to water and therefore water soluble. When you first combine the water and the psyllium husk powder, you may notice that it gets thicker and thicker. This is the mucilage at work! Like the sudsy slime, this slime is also a colloidal suspension. But instead of a gas dispersed in a liquid, this slime is made up of a liquid (water) dispersed in a solid (psyllium husk particles). We then use heat to speed up the rate of dispersion by blasting the mixture in a microwave. If it overflows, don’t worry! It’s very easy to peel off and stuffed back into the bowl again, just use cutlery since it’s super hot! The resulting slime, once cooled, is cold and clammy to the touch, but comes off relatively clean. It does not self-heal, so after it has broken or been cut, it is difficult to stick the pieces back together again. Now that the kids have had their messy fun, why not get them to think about slime that occurs in nature? 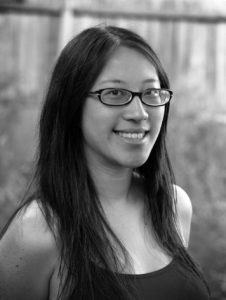 Learn about gelatinous slime moulds that can solve mazes, and some cultures eat as a delicious delicacy! Plants like cacti and aloe vera are full of gooey mucilage, the latter is great for healing burns on our skin. 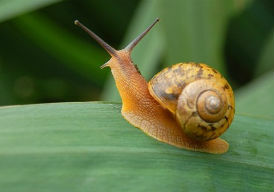 The trail of slime that a snail leaves behind comes from the mucus it produces to keep its soft squishy body from drying out. Hagfish, a primitive scavenging sea creature, can produce bursts of slime to suffocate its attacker when threatened. The possibilities are endless! 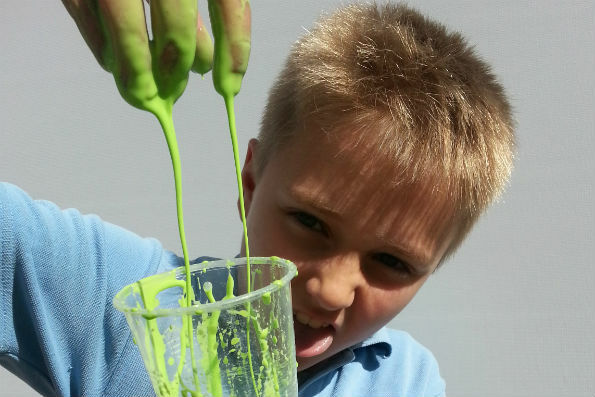 When we think of slime, our minds conjure up an image of something sticky, gooey, cold, clammy and almost always: GREEN. Most slimes are actually a type of material called non-Newtonian fluids, which are fluids that have variable viscosity. Viscosity is the measure of a fluid’s resistance to change shape or flow, under shear stress. It is often simplified to describe how thick or thin a liquid may be, because a highly viscous liquid flows slowly, and a low viscosity liquid flows quickly. Normal fluids that have a constant viscosity, for example, water is the same thickness whether it is sitting in a glass or you are swimming through it. For non-Newtonian fluids, they sometimes behave like a liquid and other times a solid, depending on the force applied. Explore slime further with our Super Slime Party!